University of California Press, 9780520266162, 224pp. America’s long romance with the train has been the subject of many books, but none has used contemporary maps to comprehensively illustrate the story. Until now. 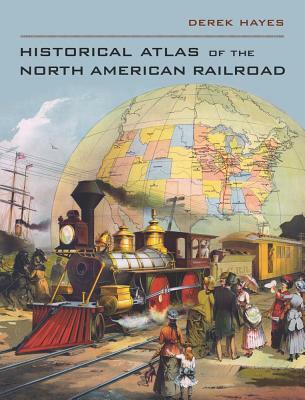 Here the latest of Derek Hayes’s historical atlases delves into the history of the railroad in North America, from its origins in Britain in the 1820s and short lines connecting Eastern Seaboard rivers in the 1830s to Amtrak and the modern intermodal freights driving today’s railroad revival. Colorful and informative, the book covers a vast range of topics and offers an impressive array of types of railroad map, from the purely utilitarian to the gorgeously promotional. Nearly 400 old railroad maps, most in full color, plus many historical photos, brochures, and posters, combine to provide a new perspective on the North American railroad. Historical Atlas of the North American Railroad also explains how the railroad transformed the economic and social life of a continent, fundamentally changing the two North American nations it linked from the Atlantic to the Pacific. Derek Hayes is the author of many books, including Historical Atlas of the United States, Historical Atlas of California, and Historical Atlas of the American West, all from UC Press.